For those reading this, I am sure the question in most peoples minds today, is whether there are going to be any fish around this bank holiday weekend. Well I can tell you that conditions on Chesil are going to be tough! May water and Spider Crabs snipping of your hooks are wreaking havoc on what should be good fishing. The strong cross wind that was present all day yesterday will continue until late this afternoon, when it will peak, change direction and calm down to a stiff breeze for the next few days. There are plenty of marks other than Chesil that may fish with more success. Why not try Mullet fishing in one of the Harbours? Weymouth, West Bay and Christchurch Harbour in Dorset, or Lymington, Hillhead, Gosport and Fareham Creek in Hampshire are just some of the great Mullet marks in those areas. If you want a variety of species then Weymouth Stone Pier, or Swanage Pier are great marks. Head for Portland for Wrasse and Pollock. If you are determined to fish Chesil Beach, here are a few tips that might help you: Use braid hooklengths. It doesn’t completely stop the crabs cutting through the snoods whilst they are chomping on your bait but it certainly lasts longer than mono. 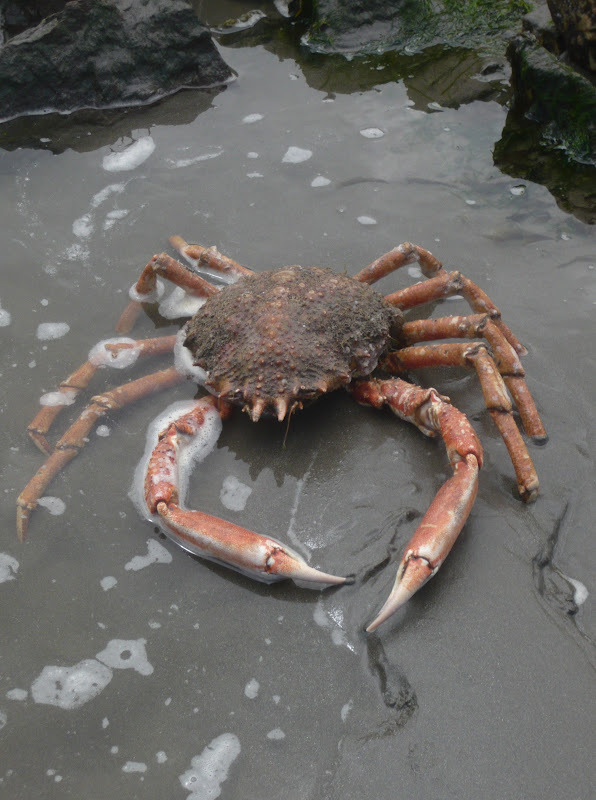 Try with crab baits, even though the Spider Crabs are cannibalistic, it is probably their least favourite food. If you are able to get some then live Pout, or Joey Mackerel wont be effected, though this does limit you to mainly Bass. Tie up some rigs that have shorter hook lengths further up the rig body, so they are not lying on the sea bed. I hope everyone is able to find there way round the new site layout. Feel free to give feedback on things you do and dont like. Chesil Beach: Choppy with a 1m swell. The water is coloured. Portland: waves of around 1m, with poor water clarity. Chesil Beach forecast: Plaice, Dabs and Rays will be all still happily feed in the May water. the problem is getting the baits seen, so use bling and beads. I would expect to see a lot of Mackerel caught this weekend from all along he beach. Portland: We have a good evening tide for the bnext few days if you wat to try for a Pollock of the Bill. White Sidewinders and Savage Gear Sandeels will be great lure choices. Portland Harbour: There are some Bass and Flounder in the Harbour now. I fished it yesterday and was told by a guy snorkelling that he had seen 6 large Bass near the Marina. I also almost stood on a large Flounder, whilst I was wading. The reefs toward Sandsfoot produced some small Wrasse. Weymouth Bay: Stone Pier is fishing well. Mackerel and the first Garfish have been caught there, along with Pout, Pollock and Wrasse. Hi, I fished Friday night and most of the day at abbottsburry, more or less strait out in front of the car park, had no luck there :(. Seen one mackerel caught and that’s was it. Used rag worm, squid, sand eels and live peelers. Was bringing in brown gunk on my line on times. Does this have any effect on the fishing? On Sunday I fished the cove next to Portland using live peelers and still no luck. Asked a few people if they had caught anything and they also hadn’t caught. So do u think its down to this brown gunk and what is it? The brown gunk is known as May water locally. It is an algae bloom that normally lasts for 3 to 4 weeks. It does have an effect on the fishing.